The first time I ate tiramisu was in Rome about 25 years ago. After ordering and eating the third portion, I went back to the kitchen and I asked for the whole baking dish. The chef or sous-chef whatever he was, looked at me with awe… I am rather “petite” in size and the whole thing seemed quite bizarre to him. To his surprise (I must have been his most contented customer) I didn’t disappoint him, he just felt delighted by my gesture and flattered by the appreciation I expressed for the dessert. Since then, and especially during the past 15 years, I’ve prepared the recipe many times and tried many variations, aiming to make it lighter in terms of calories. 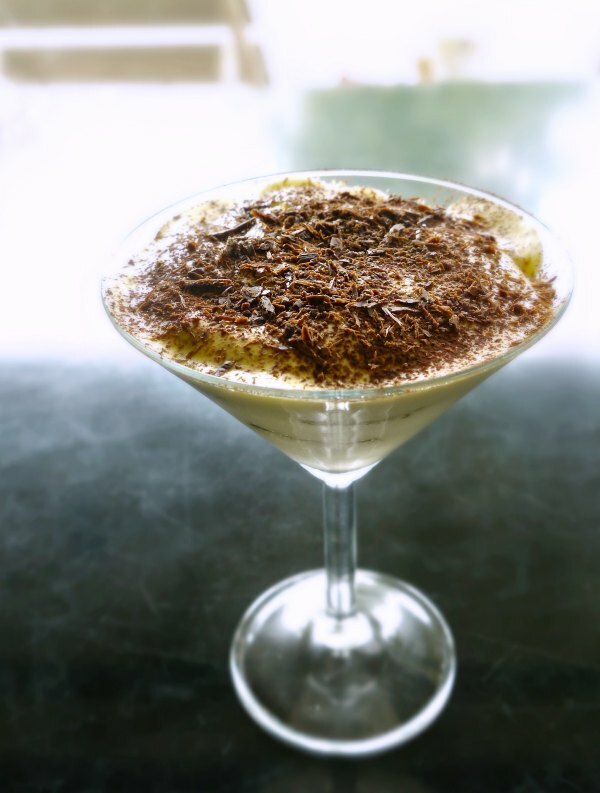 The history of tiramisu, which is relatively quite new (around the 1960’s), states that this delectable dessert was invented at the restaurant El Toula, in Treviso, Italy, to become one of the Italian classics with international appeal. However, there is considerable debate around its origin and kinship with zuppa inglese, which is the Italian version of the English trifle. Officially, it was first mentioned in Giovanni Capnist’s cookbook I Dolci Del Veneto, published in 1983. Other sources claim that its creation belongs to Roberto Linguanotto’s apprentice, Francesca Valori, whose maiden name was Tiramisu, and that Linguanotto named the dish after her to honour her talent. Tira-mi-su means “pick me up” (tirare = pick), but in Veneto’s dialect also means to give back the strength, to revive, to awaken, which by extension infers a sexual connotation… In fact, surrounding the bustle about the origins of the name, there is a delightfully apocryphal one that places the invention of the dessert at an Italian bordello, due to its power to reinvigorate the exhausted clientele! I am not quite sure how “tira-mi-su” inspired Ephron. Was it the verb “pick/lift” that means “lift-me-up”, similar to “pick-me-up”, or the recipe itself, including ladyfingers layered with a rich mascarpone topping? Whatever it was, the “humble” dessert marked a turning point in the cultural sophistication of the USA, and became food for further thought on culinary evolution. The popular tiramisu is considered a semifreddo, which means that is served cold but not frozen and has many variations, all based on the combination of mascarpone (no philadelphia cheese, for heaven’s sake) and strong espresso coffee, eggs and ladyfingers dipped in marsala, porto or another sweet wine or liqueur and chocolate, ingredients that are highly dissimilar, which, if properly combined, result into an explosive, yet perfect flavour. The present recipe is the one I prefer, after obsessive experiments and a period of worship. The egg yolks are combined with the mascarpone and the egg whites beaten separately, to make the tiramisu fluffier and lighter in taste. Coffee liqueur or Kahlua imparts an added depth to the dessert, which makes it blend well with chocolate. It is heartily recommended, try it! Preparation: Half an hour. Easy and quick recipe. Prepare the tiramisu earlier because it has to stay in the fridge for at least 4 hours. You may prepare it from the day before and add extra chocolate chips just before serving. Also, you may prepare it in two serving dishes, each containing a single layer or even in glasses. The taste remains unbeatable! Choose a presentable serving dish. To prepare the coffee mixture: In a bowl or dish that fits the size of ladyfingers mix the espresso and the liqueur. Leave the mixture to cool. To prepare the cream: Whip the egg whites until very fluffy stiff peaks form. Put the mascarpone in a big bowl and add the egg yolks, vanilla extract, sugar and whisk together well (with a hand mixer or a wire whisk). Add the cream and 2 tbsp of liqueur and whisk for 2-3 minutes until the mixture is homogeneous. Use a spatula to fold quickly, first 1/3 of the mixture into the mascarpone mixture and then the remaining. Do not over mix because the mixture will loose its tiny air bubbles and fluffiness. To assemble the tiramisu: Spread a relatively thin layer of cream on the base of the serving dish. Dip the ladyfingers for a few seconds in the cold coffee-liqueur mixture and place them the one next to the other on top of the cream. Pour Put on top a layer of cream and repeat with a layer of ladyfingers, finishing with cream. Even the surface and sprinkle with cocoa powder (put cocoa powder in a sieve and shake it over to dust evenly the surface of the dessert). Cover with cling film and refrigerate for 4 hours (do not freeze). To serve: Grate chocolate with a handheld grater on top of the tiramisu and serve with a serving spoon on the side.